Bill Gates speaks during the World Bank/IMF Spring Meetings, in Washington. Tech moguls Gates and Mark Zuckerberg are teaming up to help develop new technologies for kids with trouble learning, which will include dabbling into child brain science. 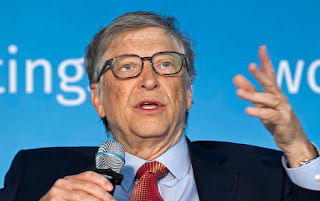 The Bill and Melinda Gates Foundation and the Chan Zuckerberg Initiative said Tuesday, May 8 they will begin exploring a number of education research and potential pilot projects together. The Bill and Melinda Gates Foundation and the Chan Zuckerberg Initiative intend to explore a number of potential pilot projects. They'll focus on math, writing and brain functions — key areas of classroom learning that they note are crucial for academic success. The joint project by Gates and Zuckerberg details possible ways to mitigate those shortcomings. Among the ideas is using games and technology simulations to support teachers and family, and tracking progress in certain vulnerable student populations such as kids with disabilities or those who are learning English as a second language. Leaders of the effort say technology is not a primary focus, but they recognize the role it can play. The new endeavor marks the latest effort by deep-pocketed philanthropists who have tried with little success and much controversy to change entire school systems. Gates, the world's top philanthropist, recently announced more support for students with disabilities, issues involving American poverty and Alzheimer's disease research. Zuckerberg idolizes Gates as an inspiration in professional and philanthropic work. But their representatives rejected any notion that their effort on learning is connected to their respective business roles as Facebook CEO and Microsoft founder.